When presented effectively, an interactive chart helps the audience to get an overview and in-depth look of complex data. In this article, I will show an example of using interactive charts effectively. I also introduce R markdown as one of the most efficient ways of authoring data-rich documents. Visualizing data lets us see the bird's-eye view of data. Suppose we made many observations of ozone and temperature to learn about air quality airquality . We can plot temperature (F) and ozone level (ppb) on the x and y axes, respectively as in Fig. 1. Just by looking at the plot, we gain a little insight on the relationship between the two measurements. A more sophisticated visualization can present higher dimensional data on a flat surface: it explains not only the relationship between x and y, but also y and z, z and x, and so on. We can add wind speed measurements (mph) to our plot (Fig. 2). Figure 2: Ozone level, temperature, and wind speed. Lighter blue indicates higher wind speed. In the plot, I showed the wind temperature in shades of blue. A lighter blue indicates higher wind speed. We can observe that the wind speed tends to be low when the ozone level is high. After getting an overview of the data, we may want to look at more detailed views of particular parts of the data. What if we want to know when the highest ozone level was observed? Fortunately, we use computer screens to view the graph more often these days. You can hover the mouse cursor over Fig. 3 to reveal the date of the observation. Figure 3: Interactive chart of ozone level, temperature, and wind speed. Hover the mouse cursor over to reveal the date. Thanks to recent developments such as rCharts, it is now much easier to author and publish data-rich documents in R markdown. Within a single text file. Having to switch between different programs to complete each of those tasks can be very disruptive to your thought process. With R markdown, we can focus on the research without being distracted by how each tool works. Figure 4: Interactive chart: Daigo’s Twitter impressions and engagements in 2014. The size of the bubble corresponds to the number of engagements. Hover the mouse cursor over to reveal the details. 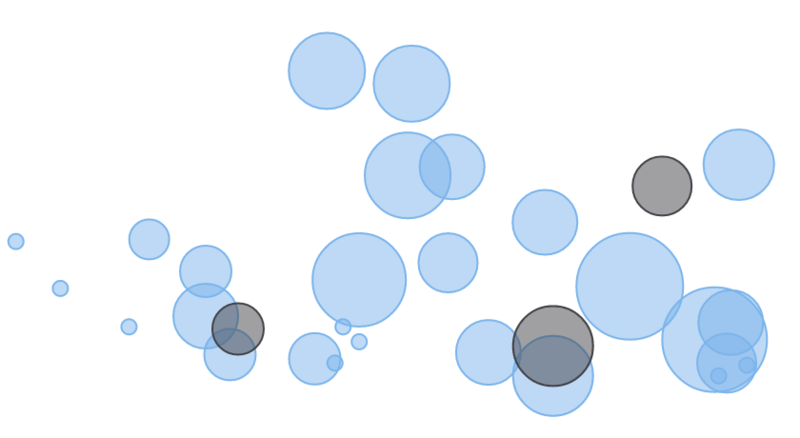 A bubble chart like this is one way to effectively visualize the relationship between three variables. The chart above is also colored to distinguish between tweets in English and Japanese. Presented in this way, it is easy to see the majority of my tweets are in English. After getting an overview of the impressions, engagements, and frequency of tweets in each language, I may want to find out which tweets actually got very high or low impressions or engagements Hovering the mouse over a bubble will reveal the content of each tweet. Each group can be toggled on and off, and the chart adjusts the zoom automatically. The entire source of this article is available for viewing. You can see the entire change history of this post.